Mirage Frameless Glass are specialists in the supply and installation of frameless glass pool fencing. FREE quotations and site inspections in Sydney and surrounding suburbs. MIRAGE FRAMELESS GLASS has over 10 years experience in making great pool fences and balustrades at affordable prices. From concept to completion; you will deal with Amon Walker. Amon is a qualified carpenter who has worked with various large pool fencing companies during his trade career makes him one of the most trusted fencing Specialists in Sydney. Mirage Frameless Glass & Fencing supply and install glass fencing for swimming pools and glass balustrading frameless shower screens , wen also install glass splashbacks. With over ten years of expertise and over 200 pool fences in the Sydney sector. We can take your job from beginning to finish with a minimum of fuss and to a high standard. Our customers tell us they value our craftsmanship, our service and above all, the standard of our finished product. In keeping with our high standard of workmanship, quality materials and aesthetically pleasing designs. Your neighbors, as well as your family will congratulate you on your new investment for your home. We are situated in Castle Hill in fact we’re not very far from Castle Hill towers in north-western Sydney. We can come to your home, your office to discuss your glass balustrading needs and requirements from Baulkham Hills in the Hills District to Cherrybrook, Dural Glenhaven Kellyvillee and West Pennant Hills for any glass balustrade and fence job. SEND US YOUR POOL DESIGN AND WE WILL PRICE ANY CUSTOM POOL SIZE, SHAPE, OR DESIGN!for the following suburbs in the lower/upper north shore of Sydney, Neutral Bay, Waverton, Mosman, Cremorne, Lavender Bay, Milsons Point, Cammeray and North Sydney. We can travel as far as Middle Harbour, or at the Roseville Bridge at Castle Cove and Roseville Chase to quote you a better price. 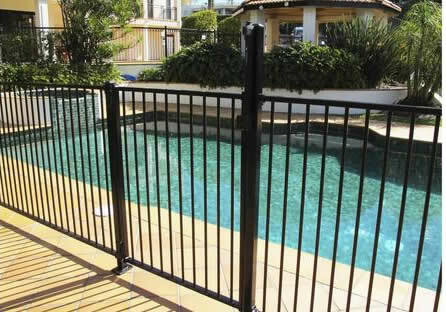 Flat top pool fencing is the most cost effective type of pool fencing on the market. It is strong and great at keeping the kids out. Aluminium is a very versatile product and can be used in all types of situations, on its own or blended with a frameless glass fence. Panels and posts com in black and primrose but other colourbond powder coating options are available. We use the trusted brand MAGNA-LATCH on all our flat top fittings and locks.